Elise Marubbio received her B.F.A in photography from the Cleveland Institute of Art. She worked as a photographer in Cleveland before moving to Tucson to study American Indian Studies at the University of Arizona. She then combined her M.A. in Native American Literature with her passion for art by pursuing a Ph.D. in Cultural Studies with a focus on the issues of race in film and media, with particular attention to the representation of Native Americans in American popular culture and Hollywood cinema. She came to Augsburg in 2003 because it is one of the few liberal arts colleges in the country with an American Indian Studies department. According to Marubbio, two key things make Augsburg a great place to come for American Indian Studies: The program’s dynamic combination of interdisciplinary study and involvement with the community; and Augsburg’s location in the city. Her courses embrace this. Her students have opportunities to interact with local Native American writers, filmmakers, artists, community action groups and organizations. They take part in day trips to various communities, galleries, and historical sites. She also leads global travel seminars focused on Indigenous issues to Latin America, including Guatemala, Mexico, and Bolivia. 1. To offer a regional venue for Native American filmmakers to present their films and to engage other communities in dialogue about the films, the process of working as a Native American filmmaker, and the politics of ethnic-identified film making. 2. To build a collaborative relationship with the local Native American community that honors the rich tradition of Native American film in Minneapolis. 3. Provide an interactive environment within which students and community participants critically engage with the tough issues raised by many Native filmmakers about America’s history, our contemporary culture, and social justice. 4. To provide reservation communities with access to films by and about Native peoples. 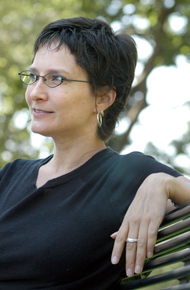 Dr. Marubbio’s areas of research in Indigenous film grew out of her explorations into how particular mainstream media images reflect the social, political, and moral attitudes towards Native Americans, interracial relationships, and the national identity of the cultural moment in which they are reproduced. As a group, media images of Native Americans and specifically Native women illustrate an ongoing ambivalence toward race and the colonial history of the United States. Thus, one branch of Dr. Marubbio’s work spans the decades from the 1910s through the present, tracing these particular themes through filmic components such as stereotypes, editing, scene sequencing, narrative point-of-view, etc. This research fuels her growing interest in the aesthetics of race and the interconnections of race and power with issues of art, representation, and nationalism. It is also the subject of a number of her published essays and her book Killing the Indian Maiden: Images of Native American Women in Film (2006, University Press of Kentucky), which won the Peter C. Rollins Annual Book Award in 2006 and the American Library Association Award in 2007. Another branch of Dr. Marubbio’s work expands from the first to focus on Indigenous film and Native women filmmakers; in particular, she is intrigued by the choices made by independent Indigenous filmmakers, the stories they tell, the style that they use to document Indigenous issues, and the approach to cinematic sovereignty that their work as a group suggests. She is currently exploring the ways in which Indigenous media sovereignty move across cinematic approaches and global audiences from tribal/community to pan-tribal, pan-Indian, and pan-cultural arenas. This has led to a third area of research and publishing on de-colonialist pedagogical and collaborative work practices designed for promoting cross-cultural teaching and research that centers Indigenous media, methodology, and theory as equal to and complimentary with western models. Dr. Marubbio’s co-edited project with Dr. Eric L. Buffalohead, Native Americans on Film: Conversations, Teaching, and Theory. (University Press of Kentucky, 2012), her current edited project with Dr. Tom Holm and Dr. Steve Pavlik, Native Apparitions: Critical Perspectives on Hollywood’s Indians (University of Arizona Press, 2017), two guest editions for Post Script: Essays in Film and the Humanities on Indigenous film and filmmakers, and her essays and interviews included in these projects engage this agenda. Native Apparitions: Critical Perspectives on Hollywood’s Indians, Eds. Steve Pavlik, Tom Holm, and M. Elise Marubbio (University of Arizona Press, 2017). “Look at the Heart of The Searchers: The Importance of Look to John Ford’s Commentary on Racism,” in Native Apparitions: Critical Perspectives on Hollywood’s Indians, Eds. Steve Pavlik, Tom Holm, and M. Elise Marubbio (University of Arizona Press, 2017). “Decolonizing the Western: A Revisionist Analysis of Avatar with a Twist” in 21st Century Western, Eds. John Leo and Marek Paryz (Palgrave Macmillan, 2015). Native American Cinema, II. Eds., M. Elise Marubbio and Angelo Baca, Post Script: Essays in Film and the Humanities (Texas A & M University-Commerce) Vol 33, No.2 (Winter/Spring 2014). “’Hands and Fee in Different Circles’: A Conversation with Angelo Baca,” in Native American Cinema, II. Eds., M. Elise Marubbio and Angelo Baca, Post Script: Essays in Film and the Humanities (Texas A & M University-Commerce) Vol 33, No.2 (Winter/Spring 2014): 7-16. Native Americans on Film: Conversations, Teaching, and Theory. Eds. M. Elise Marubbio and Eric L. Buffalohead (University Press of Kentucky, 2012). “Wrestling the Greased Pig: An Interview with Randy Redroad” in Native Americans on Film: Conversations, Teaching, and Theory. Eds. M. Elise Marubbio and Eric L. Buffalohead (University Press of Kentucky, 2012). Native American Film, Guest Editor, Post Script: Essays in Film and the Humanities (Texas A & M University-Commerce), special edition (Summer 2010). “Death of the Squaw Man’s Wife: The Politics of Cecil B. DeMille’s Adaptations of Edwin Milton Royal’s The Squaw Man” in 2003 Film & History: CD-ROM Annual (Spring 2004). “Death, Gratitude, and the Squaw Man’s Wife: The Celluloid Princess from 1908- 1931” in David Holloway (ed. ), Polemics: Essays in American Cultural and Historical Criticism, Volume 1 (Sheffield: Black Rock Press, 2004): 85-117. “Celebrating With The Last of the Mohicans: The Columbus Quincentenary and Neocolonialism in Hollywood Film.” The Journal of American & Comparative Culture Vol. 25 no. 1 & 2 (Spring & Summer, 2002).